I am excited about the learning that can happen on mobile devices (mLearning). In this post, I’ve included a few thoughts about using mLearning in schools, as well as a useful chart for choosing appropriate mLearning tools and a brief description of an activity that will engage even our youngest students in meaningful mLearning. There is great potential in mLearning. Like other methods of student engagement, mLearning requires solid planning, clear guidance, and ongoing engagement from the teacher to be a meaningful learning experience. I do sympathize with people who see mLearning as a distraction. Technology-based learning tools can too easily be thrown at students without real consideration to the purpose or the learning objectives those tools support. This is nothing new, though. Take, for example, the use of movies in the classroom. There is a huge difference in the educational value of showing West Side Story as a compare-and-contrast element when you study Romeo and Juliet in English class and showing The Little Mermaid as a reward for reading Romeo and Juliet. While using mobile devices for learning in the classroom may be new, the concept of adapting new technologies to support our educational goals is not. One way for teachers, and in our case teacher-librarians, to ensure that we offer our students engaging learning experiences with mLearning, is to thoughtfully choose our technology tools based on learning objectives. Bloom’s Taxonomy of Learning Objectives provides a valuable framework for identifying the learning focus of a lesson. 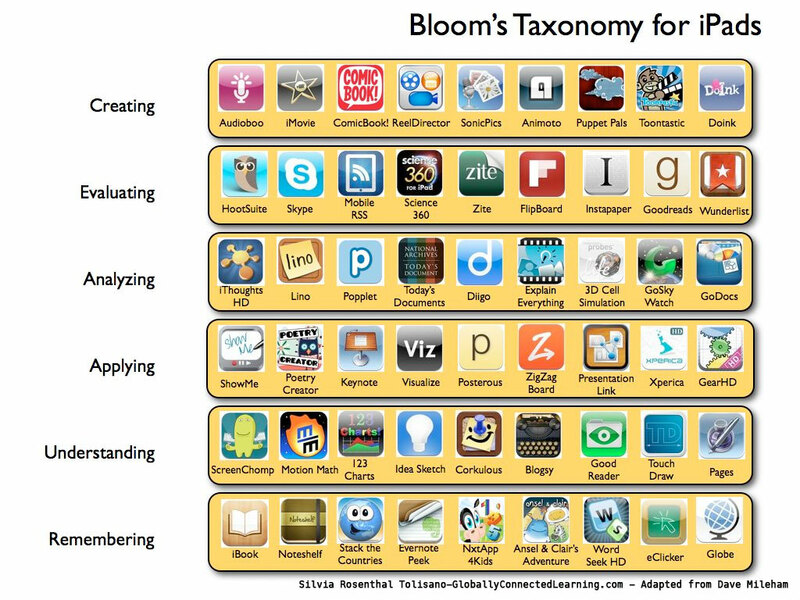 One useful chart for choosing appropriate tools to support learning objectives is Bloom’s Taxonomy and iPad Apps from the Langwitches Blog by Silvia Rosenthal, a 21st century learning specialist who emphasizes the importance of globally connected learning, technology integration, and digital storytelling. The following activity is intended for students in the Kindergarten-2nd Grade range, and focuses on the highest level of Bloom’s Taxonomy, which is creating. The app I chose for this activity is SonicPics, which currently costs $2.99 and is available for use with most iDevices. Description of Activity: In this activity, students will each tell the story of their school-day by using a classroom iPad to photograph places and people in their school to create slide show that they will narrate and then share with classmates and parents. The students will work in pairs to plan, construct, edit, and record their stories. The teacher-librarian and teacher will show students their own SonicPics recordings and then walk students through the creation process. The advantage to having both the teacher and librarian create and share their own recordings is that the students will see different perspectives and presentation styles, which will encourage free expression. Including “My School Day” stories from the principal, cafeteria workers, and school secretary would be fun, too! If students seem hesitant to start, the class can brainstorm together about things they could include. The students will be asked to take between 5 and 15 pictures to use in their projects, so each student will work with their teammate to plan what they want pictures of. Ideally, the teacher-librarian will coordinate to allow students access to photograph the lunchroom, playground, principal, and anything else they think of. If this is not possible, students will be invited to send the teacher out as their reporting photographer by telling the teacher who or what they would like photographed. The students will be given assistance as they discover the process of ordering their photos and recording their audio narrative. These tasks will be presented on instruction sheets as they are in the app, graphically with text clues, so that students who are not able to read will still be able to succeed in the process of adding and ordering pictures, as well as recording themselves. Depending on student experience with mobile apps, the teacher-librarian will provide further examples, and group and individual instruction. Older students will be asked to also include a title or description with each picture. Younger students will use only audio to accompany their pictures for this activity. All students will have the opportunity to share their video with the class and with their families. American Association of School Librarians 4.1.8 Use creative and artistic format to express personal learning. Benchmark: Use technology tools to create and present ideas. Motivational Value: The novelty of using a technological tool that the students have not used before will certainly capture student attention, as will the teacher-librarian and teacher presentations of their own projects. Because this project provides students, quite literally, a voice to share what is most important to them about their school day, the relevance of this project to students is expected to be high. Student confidence will vary—some of the students will have used different mobile apps on parents’ smartphones or other mobile devices and will be familiar with the methods of interacting, some will not. When possible, these students will be paired so that they can peer tutor. Student satisfaction is expected to be high in this project because there are multiple opportunities to share their work in a supportive environment. I hope that Rosenthal’s Bloom’s Taxonomy for iPads and my My School Day audio-visual activity inspire you to think about ways you can use technology to help students learn, explore, and create. Thanks so much for the information. My son, who has Aspergers and ADHD has problems with written assignments. Introducing mLearning provides him an opportunity to stand on equal footing (or excel) with his classmates. You are welcome! I agree wholeheartedly that mLearning opens the door to wonderful opportunities for students to share and create in ways that are meaningful and appropriate to them. Here’s to all children being given the tools, opportunity, and support to reach their full potential!